Sarah Adkins wrote this post as a final project for Stacy Krueger-Hadfield’s Science Communication course at the University of Alabama at Birmingham. She is a MS student working with Dr. Jeffrey Morris at UAB. They are looking at how microbes (i.e., phytoplankton and E. coli) change through long-term evolution in order to better understand their ecology. Her research integrates microbial eco-evolution with interdisciplinary approaches to art and science education. With Dr. Morris, she is testing the effectiveness of new scientific inquiry and art models in the science classroom, building on her background in biology (BS Integrative Biology) and art (BA Studio Art). If you start making your own Petri Dish art, share it with us @petridishartuab on Instagram or use #petridishartuab. What would the world be like with only red, yellow and blue? Can you imagine a world without purple, orange, and green? Just like primary colors, academic disciplines can only get us so far. Crossing disciplines, like mixing colors, can open up vibrant new possibilities. 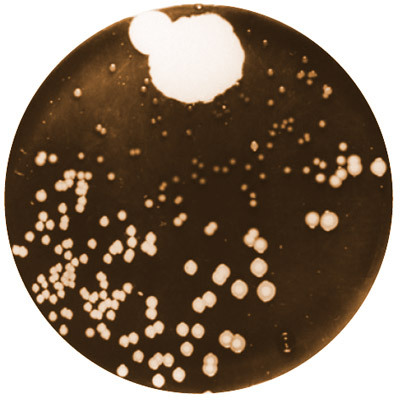 For example, Alexander Fleming’s artistic thoughtfulness while studying microbial ecology in a Petri dish enabled him to detect antibiotic resistance, and, thus, discovered penicillin, the first antibiotic. This discovery is a striking example of how blending disciplines pushes our collective science knowledge forward. So, how can we invite young scientists into that same art of discovery in order to encourage them to become scientific innovators? Many college science students merely memorize information from PowerPoint slides. I was one of them. Yet, this does not represent how students learn best, nor does it reflect the creativity and imagination necessary in order to be a successful scientist. Even in science labs, where science is supposed to be dynamic and exploratory, there is often a linear “cookbook” protocol for students to follow. Dr. Morris, a microbiologist at the UAB, and myself, a graduate student with a background in fine arts and microbial ecology, are proposing curriculum changes for a microbiology lab at our university that will stimulate creativity in the science lab classroom by turning scientist students into artists. Our microbiology students begin by designing their own mandala, which are circular and symbolic symmetrical artworks. Then, they use different colored bacteria they’ve isolated from the soil to paint their mandala design on a Petri dish. 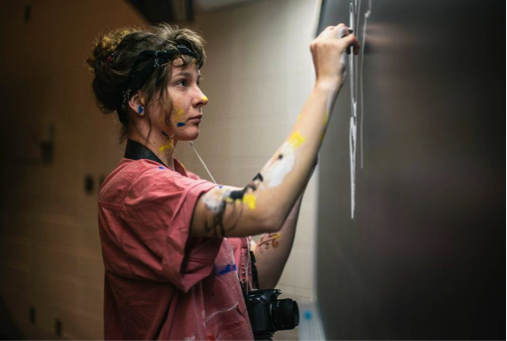 A UAB student creates petri dish art based off a personalized creative design. But, how do they get different colored bacteria? Well, different bacteria express different pigments in response to different environmental stressors. So, when they took a soil sample back to the lab and plated it, some of their bacteria were stressed out. We see that a few days later as vibrant dots on their plate. The students plucked those dots and streaked them on a new plate to purify the sample. They use those new streak plates as their “bacterial palette” to create their art. Because they are working with microorganisms, they cannot see what they are painting until the bacteria has grown. It is like painting with invisible ink! Over the course of several days, their images will emerge. But, the story does not stop there. Not all of their bacteria grew. Left: A Petri dish art mandala only using purple-pigmented bacteria. 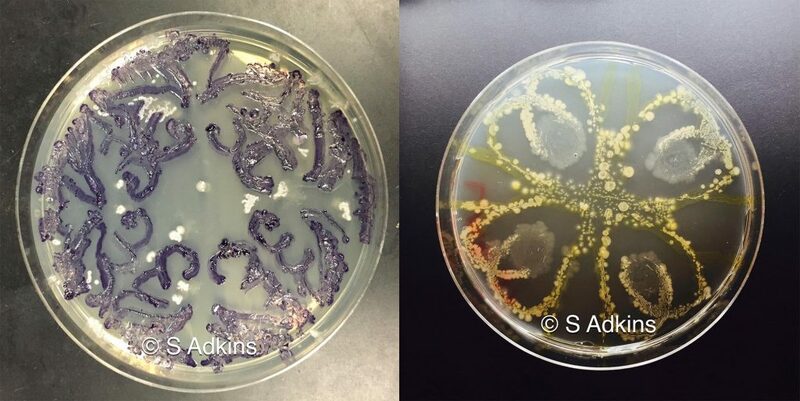 Right: A Petri dish art mandala where the purple bacteria growth was suppressed. These discussions lend themselves to ecological questions like how the bacteria “know” what’s going on (answer: chemical signals) or if advantageous traits in one environment can be disadvantageous in another environment (answer: absolutely!). Students will go on to barcode their bacteria for identification and to further their discussions. We’ve run PCR on our orange bacteria, which was Micrococcus, and our yellow bacteria, which was Pseudomonas, but to identify our purple we have some more mixing to do. What are other ways science teachers use art in their classrooms? Our method, put simply, is to have students create personal art related to the theme of the course, which could be done before or during the implementation of an individual research project. For instance, students in a molecular ecology class could make hypotheses regarding the change in relationships between organisms of their choosing over time, and draw a comic showing the results (i.e., illustrate how natural selection population compositions over time). Biometry students could a make testable hypothesis about an agricultural or environmental problem dear to them in their community (i.e., deforestation), for which they keep a Darwin-like notebook for notes and drawings, and so forth. 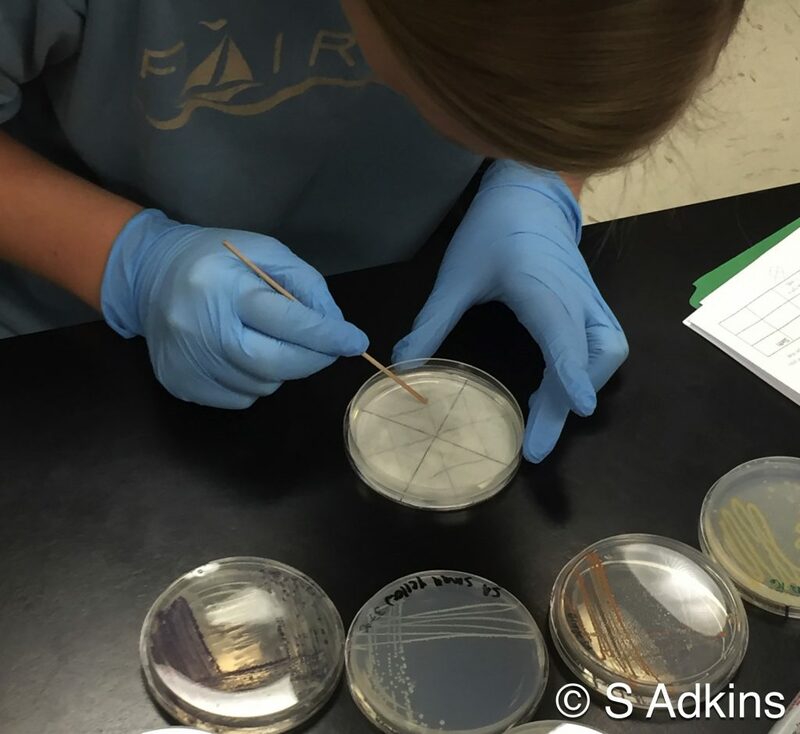 In addition to engaging these students, their illustrations (like the petri dish art or proposed comics or notebooks) will also serve as a platform for other people to understand your student’s scientific question. Opening this door to art for your science students could very well lead to new scientific discoveries. This entry was posted in blogging, Coevolution, evolution, methods, microbiology, natural history, selection and tagged Blogging, microbiology, PetriDishArt, Science and Art, Science Communication, teaching. Bookmark the permalink.